THE pioneer of an international revolution in perfume making has just one dream: to invent the boldest perfumes, the ones advocating unconditional luxury. The profound studying of Hippocrates’ and Theophrastos’ work on perfume making, the aroma of incence rising from the serene houses of my neighborhood, the citruses in the grey Athenian streets, the precious flowers adorning my parents’ home, the wet soil and the aromas of wild herbs thriving in the Greek mountains, the sea breeze, the spices and essences, I dearly collect in my travels around the world, and a pure oudh birthday present from Saudi Arabia, were more than enough to instill the fine art of the perfumer in me! At first my devotion was limited in exclusive brands. As I was fed up though, with the clichéd essences, (amber, oudh, vetiver, etc) and dreading their toxic chemicals, I made a wager to become the first both Greek and international perfumer, who will revive the magic of Greek ancient perfume making! “Wherever has human personality gone?” “Whatever will be left of our memories when they all smell the same?” Tantalizing questions for a sleepless perfume maker! If this world is not big enough for my unconventional ways, then I will make room for perfumes which will make it unique!”. 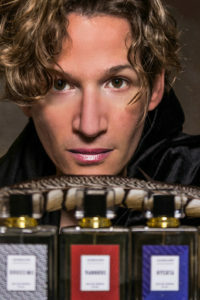 And one night, shielded by this very thought, I abandoned my career as a journalist, envisioned an emblematic, multidimensional and free willed soulful field and traveled to Grasse and Florence (Academia Lorenzo Villoresi), where I was inducted in fine perfume making by the greatest niche perfumers. In 2018 I founded my very own studio-perfume lab, JOURNAPER PERFUMES in Athens, and ever since my stirrer has been working full-speed to mix my revolutionary boldness and innovation with secrets taken by ancient Greek perfume making, and above all my need to invent sensuous perfumes, ones due to offer an unbelievable experience! It is now that I have come to realize why JOURNAPER perfumes have become phenomenal. The very first try, effortlessly turns into an addiction, embracing your body and soul, like an enchanting aura. I am hardly interested in what the majority demands! I create and devote myself to those few people who seek UNIQUNESS, but also to others who have yet to dare! THEREFORE I GIVE YOU MY WORD THAT EVERY NOTE IN JOURNAPER LAB IS HIDING AN INSURMOUNTABLE OLFACTORY EXPERIENCE. SPRINKLE…AND LET US SHARE IT!